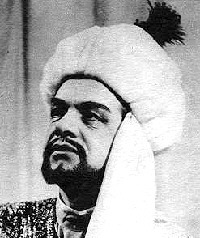 The tenor, Ilija Jossifov, was born in Kotel in April 1912. As a child he studied violin. His career began first as a lawyer after graduating from the Department of Law in Bulgaria. While at the State Academy of Music he was first tenor with the Co-Operative Operetta Theater. His debut was as Pinkerton with the Sofia National Opera in 1945. International appearances took Jossifov to the Vienna State Opera, Kirov Opera and stages in Roumania, Turkey, Yugoslavia, Poland and Czechoslovakia. The Russian critics considered him to be a great Lensky. After more than 600 stage appearances he retired from singing in 1962 becoming a famous teacher in Sofia, the Leningrad Conservatory and the Riga Opera House. His favorite pastime was hunting in the mountains of Bulgaria. Ilija Jossifov died in Sofia on June 29, 1993. Tchaikowsky: Eugene Onegin "Lensky's Aria"